When I reviewed the recent disc of Stanford String Quartets played by the excellent Dante Quartet I said that the Somm catalogue was going from strength to strength. 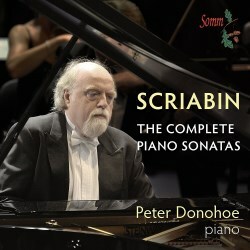 Yet further evidence of this is given here in this excellent set of the complete published Scriabin Piano Sonatas played by the superb Peter Donohoe. This is not Donohoe's first release on Somm - there have been three discs of the Prokofiev Sonatas as well. Recording these Russian sonatas moves Somm a little away from their core repertoire and as such they are entering a fiercely competitive field. The catalogue bulges with discs and sets of these works but these performances can be measured against the finest. Can Peter Donohoe really be in his 60's? - I remember his early concerto forays with the Royal Liverpool Philharmonic and his success at the 1982 Tchaikovsky competition and even back then spectacular performances of the Rachmaninov 3rd concerto marked him out as having especial sympathy for the Russian Romantics. On disc, aside from award-winning Tchaikovsky, Donohoe has generally recorded less familiar repertoire so all the more gratitude for this pair of discs. In many ways Scriabin's ten published Sonatas are an ideal introduction to his music and more importantly his musical aesthetic. He died tragically young at just 43 and his composing life spanned just over twenty years - neatly framed by these sonatas; the first - Op.6 - written when he was just twenty and the last - Op.70 - the year before he died. They fit neatly onto two well-filled discs and even for the innocent ear or first-time listener the progression from [relatively] traditional Romanticism to ground-breaking manipulation of harmony and form is evident. Many pianists are attracted to the opportunity to record this demanding cycle. Aside from the vast technical challenge there is a musical one just as problematic for would-be interpreters; how to address the enormous change in style mentioned above while at the same time giving the set a sense of musical unity. Many fail - nobly - revealing greater empathy for one period of Scriabin's stylistic evolution than another. Donohoe chooses an eminently sane approach which moderates either extreme. This does come at the expense of some of the hedonistic wildness that some performers find. My first ever encounter with a Scriabin Sonata was Horowitz's ecstatic performance of No.5. This a key transitional work in Scriabin's works - from then on all his Sonatas were written in single movement form. Next to Horwitz, Donohoe sounds positively rational, for good or ill depending on your preference. No surprise that in direct comparison Donohoe is far better recorded - there's that bright 'clang' to the Horowitz/RCA recording which marked out so many recordings from that source at that time. But next to Michael Ponti on Vox, Horowitz in turn sounds staid. Ponti hurtles through the work a full two and half minutes quicker than Donohoe - with notes and phrasing flying in every direction like some run-away train. Its often not accurate and it certainly isn't subtle but I have a sneaking hunch that the spirit is something quite like what Scriabin was after. I find the greatest benefit in Donohoe's approach is in the later Sonatas. Scriabin's handling of form and harmony does push the boundaries of what is easily followable by the average ear alone. In other hands this can leave the music feeling diffuse and even incoherent. Donohoe finds a way of binding the music together, and while it is still often a complex listening process he is a certain and illuminating guide. In doing this he finds closer musical parallels than I have often identified with Debussy's impressionism. For sure, these are very different harmonic palettes and keyboard characteristics, but are somehow allied. Listen to the perfect poise of the opening of the 10th Sonata. My only observation is that for some reason I do not find the chosen instrument as recorded here quite as pleasing as some. It is the ever-dependable production team for Somm of producer Siva Oke and engineer Paul Arden-Taylor but for some reason the piano in the Turner Sims Concert Hall seems to emphasise the mid-range a fraction more than I would ideally like. Certainly, in direct comparison with the recorded sound afforded Maria Lettberg on Capriccio, it sounds a touch 'tubby'. Lettberg is willing to rhapsodise in these later works more than Donohoe who, with the exception of the 8th Sonata, is consistently quicker than Lettberg. It will be for individual listeners to decide which approach they prefer - I have to say I like both and substantially prefer both to the rather plain and literal approach of say Ashkenazy in his well-regarded Decca cycle. Of course, Ashkenazy is technically excellent but short on fantasy and the piano tone here verges towards the clangorous at climaxes. The Donohoe set of the sonatas is supplemented by the late and intriguing Vers la Flamme - a musical representation of the earth being consumed by the rays of the sun and encapsulates Scriabin at his most visionary - in probably a very literal sense. It makes for an effective and ecstatic conclusion to the set. As usual with Somm, the complete 'package' of their presentation is excellent. The pair of well-filled discs is presented in a standard double slim-line jewel-case with a booklet printed on high quality paper. This contains an excellent essay - printed in a sensibly sized font! - by Jonathan Summers [English only] as well as an artist biography. If there was room on my musical life-raft for just a single set of these remarkable and challenging works I would with regret not choose this new set before all else. But as a document of a remarkable artist's consistently profound insight into an elusive composer's work this is a treasurable set.